1- Where are the farms? 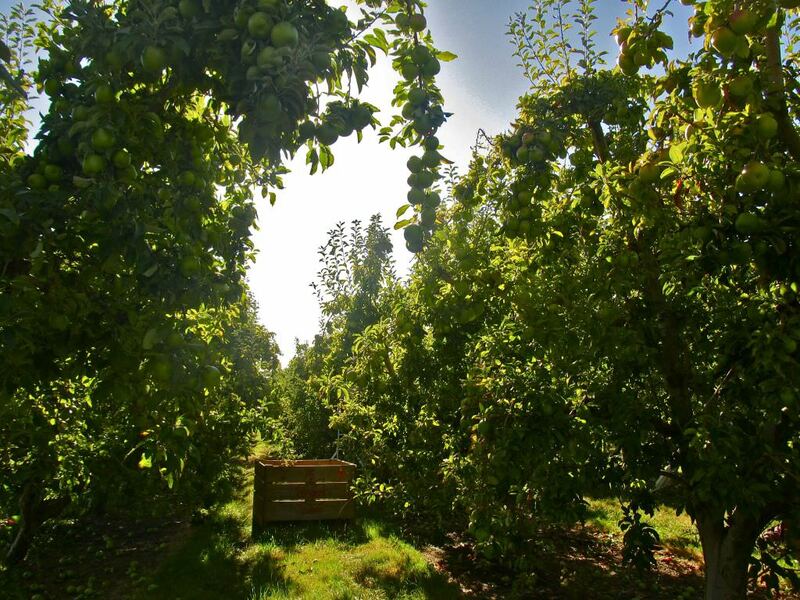 The Australian apple industry represents a good opportunity for travelers to location/tasmaniafind a seasonal job, as the orchards are still relying on human labor for apple picking. Furthermore, farmers usually don’t find enough local people to fill these seasonal positions, especially when the production areas are far from the main cities. Apple picking is physically demanding and being young and fit sure is an asset for this job, making it perfect for backpackers travelling on a Working Holiday Visa. Even if Australia is a lot bigger than New Zealand, its apple production is slightly smaller: the total harvest was estimated at 300 000 tonnes in 2014. It represents at least 4300 apple picking jobs over the apple season. The main difference in comparison with New Zealand is that Australia is only exporting 2-3% of this apple crop, so the vast majority stay on the Australian market. For a picker, it generally means a lower quality control and more strip picking. There are more than 600 apple growers in Australia. Apples are grown in 6 different states of Australia and in most of them, there are several apple growing areas (see map below). In the past, Tasmania used to be one of the world’s major apple growing region (for many years the island was referred as “Apple Isle”), but a big part of this industry collapsed in the last 50 years (higher costs of production than the mainland, big decrease in apple export to the UK), resulting in many orchards being pulled out, and often replaced by cherry orchards. 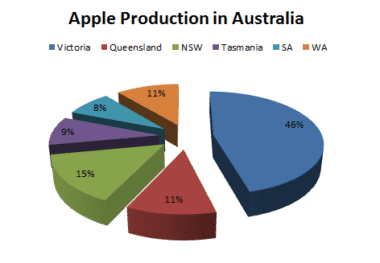 Today the apple production in Tasmania only represents 9% of the Australian crop, and the state of Victoria has now become the main player, representing almost half ot the national production. New South Wales, with 15% , is also a big apple state, especially around the cities of Batlow and Orange. 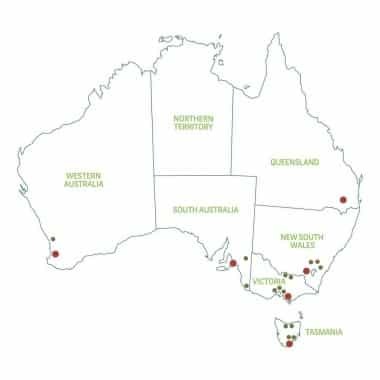 The three remaining production centres are around Stanthorpe in Queensland, in the surroundings hills of Adelaide in South Australia, and between Donnybrook and Manjimup in Western Australia. You can find more details about each different growing area on the Aussie Apple website. 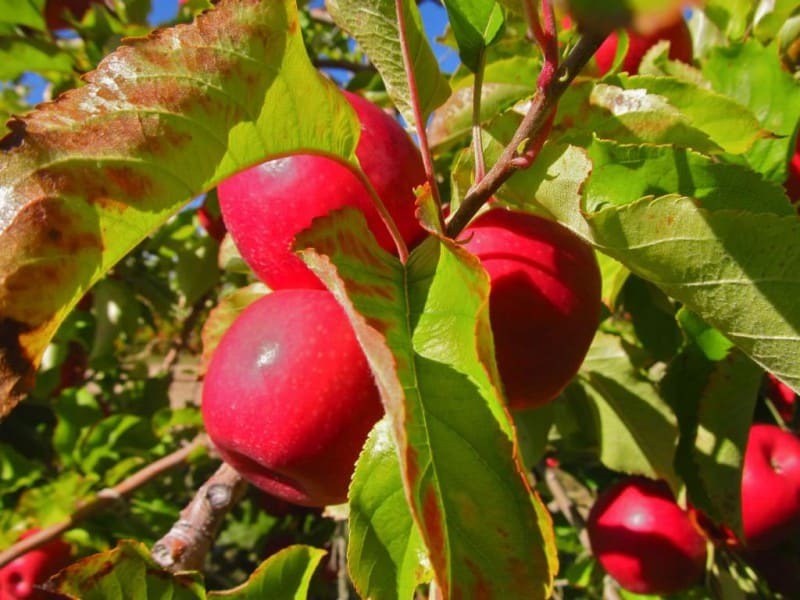 As for any other fruits, the apple picking season first starts in the warmest growing areas and slightly move to cooler and/or higher elevation zones. It means that the apple harvest doesn’t necessarily starts or finish at the same time everywhere in Australia. The first apple of the season are often harvested in early february in Queensland (around Stanthorpe), and in northern Victoria (Shepparton and Cobram). But usually, most of the Australian apple farms don’t start picking till late-february or early-march, even as late as mid-march for the most southern farms of Tasmania. But once again, never take anything for granted in horticulture, and remember that depending on the year and the local weather conditions, those starting dates can vary a lot, sometimes up to two weeks. The length of the season will depend on how many varieties the farm is growing, but it’s commonly around 10 weeks. It means that most of the farms are done with their picking by the end of April or the beginning of May. In some particular cases (i.e. the farm is growing many late varieties or planted some blocks at high elevation), I’ve seen some farms still harvesting in the third week of May. Here are the main apple varieties grown in Australia, arranged according to their order of appearance during the season : Royal Gala, Red Delicious, Jonagold, Golden Delicious, Granny Smith, Fuji, Ogura Fuji, Cripp’s Pink (Pink Lady TM), Cripp’s Red (Sundowner TM). As an apple picker, you will be asked to fill some big wooden containers called “bins”. Once full, they weight around 350 kg. It represents 17 to 25 picking bags, depending on the model of bag and on how much you fill it before you go and unload it to the bin. I’ve seen pickers packing their bag so much that they would just need 14 of them to fill a bin, but it’s way too heavy and I prefer to try filling mine with 20-21 bags. Depending on the variety involved, either you will be asked to do some color picking (you only pick the apples matching the color asked by the farm), or you will have to do some strip picking (you must pick all the apples from the trees, without missing any). Royal Gala, Jonagold, Ogura Fuji, Pink Lady and Sundowner are usually color picked, while Red Delicious, Golden Delicious, Granny Smith and Fujis can be strip picked. Of course strip picking is usually easier than color picking, but be aware that sometimes even strip picking can be tricky : not missing a single green apple in a green foliage isn’t simple! 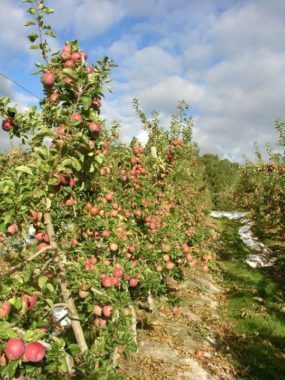 Quality standards in apple picking can be slightly different from farm to farm, but in most cases you will be asked to be gentle when dropping off your apples in your bag or in your bin, in order to avoid bruisings (unless you are picking for juice). It’s particularly true with Golden Delicious and Pink Lady, which are both as delicate as eggs and can even bruise with too much pressure from your fingertips. Also, you will be asked to make sure the stem remains on, on every apple you pick. That’s why you must “twist” the apple along the branch to get it off the tree, instead of just “pulling” it. In most of the Australian orchards, apple picking is paid on contract, meaning that instead of being paid a fixed hourly rate, you will get paid depending on your production (i.e. how many bins you picked). So there is no secret, the more you pick, the more you earn! Well,… then the next important question is to know how much you will get paid per bin and how many bins it is reasonable to expect per day. Here is the core of the problem : it all depends! Regarding the price, strip picking is usually paid in between 28-33$ per bin. Personnally, I would never pick in Australia for less than 30$ a bin. I’m aware that many contractors are offering as low as 25$/bin, but I recommend you to never accept picking for such a low rate in Australia. As it would usually take you a bit more time to fill a bin while color picking, it’s usually paid more, commonly around 33-36$ per bin. 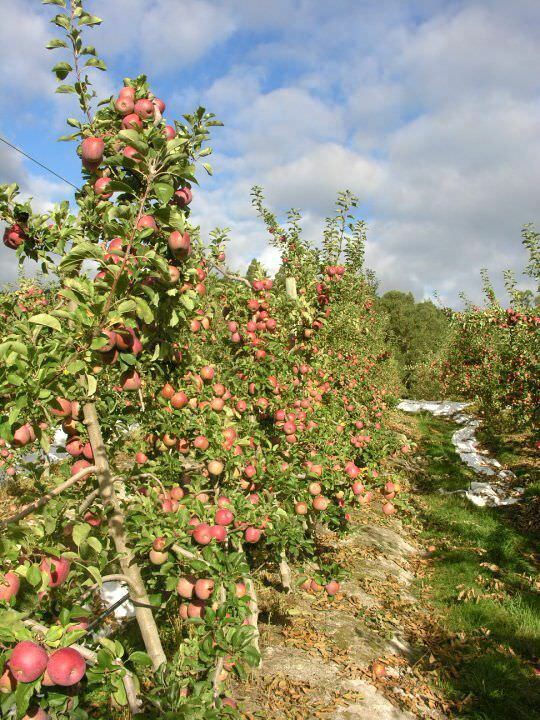 Sometimes, for really delicate varieties as Golden Delicious or Pink Lady, price can go up to 40-42$/bin, as you will have to slow down a lot to make sure not to bruise them. Both systems have their pros and cons. With the first system, you will have some really good days when the trees are small and loaded with apples, but bad days when the trees are huge and barely bear any fruits. With the second system you will probably have more consistency in your daily earnings, but you will never hit some record days, as the price will often be lower when the picking is really good. As a professional picker I often felt frustrated with the second system, as sometimes you will be picking many more bins in a really good block than in a poor block, without necessary earning more at the end of the day! But on the other side, on a bad season, the second system will make possible to keep earning decent wages even if the trees are not that nice. Indeed, an honest farmer should try to compensate the bad season with a raise in the bin rate. As long of course as it keeps being profitable for him, otherwise it can be better to just leave the apples on the trees. The number of bins a picker would pick in a day is extremely variable and will greatly depends on the quality of the trees, the variety picked, the size of the trees, the quality of the pruning and, above all, on the experience of the picker. As a novice, you first target should be to try and fill a bin in no more than 2 hours (up to 2,5 hours for color picking). It won’t be necessarily easy at first, especially if the trees are high and need a lot of ladder work. It represents about 3-4 bins on an average day of work. If you can’t reach it after a couple of weeks, then try to change farms to see if it’s better, otherwise don’t stick to it too much, it might just not be a job for you! Apple picking can be quite hard on the body and not everybody can handle it. As a professional picker (more than 3-4 seasons), I try to never earn less than 200$ in a full day picking (8 hours), and most of the time I’m able to pick an average of 7-9 bins per day (about 1 bin per hour), and up to 11-12 bins when the trees are really nice. It may look impossible when you first start fruit picking, but it’s like any other job, the more experience you have, the more skills you develop and the more money you should make. –Observe the experienced pickers. It’s definitely not a waste of time to spend 30-45 minutes at the beginning of the season to look at how the fast pickers are working and try to understand why they perform so well. –Be systematic. A common mistake of a novice picker is to pick one apple here, one apple there, regardless of any logic. You must force yourself to respect an order in the way you pick a tree (e.g. : right side – middle – left side) and stick to it for the whole day. Risk of dispersion is the number one ennemy of a picker. –Use your ladder properly. If you want your ladder to become your best ally and not the so-common “nightmare for new pickers”, you must learn to position it on the right way. Take time to always think about where the best place would be to put it, in order to reach a maximum of apples without risky stretching. A common misuse is to put it too close or too far from the tree. As soon as you need to stretch your arms to reach fruits, you should go down your ladder and position it somewhere else. –Pick with two hands. It seems evident but it’s not,… I’ve seen so many pickers picking 50% of the time with just one. Once again, you must try to force yourself (it’s all in your mind!). –Don’t pick all your bottom at once and your tops only after. Going up a ladder with a bag hal-full is tiring, useless and it slows you down. It’a always better to start filling your bag on the top of the trees and to complete it with the bottoms. 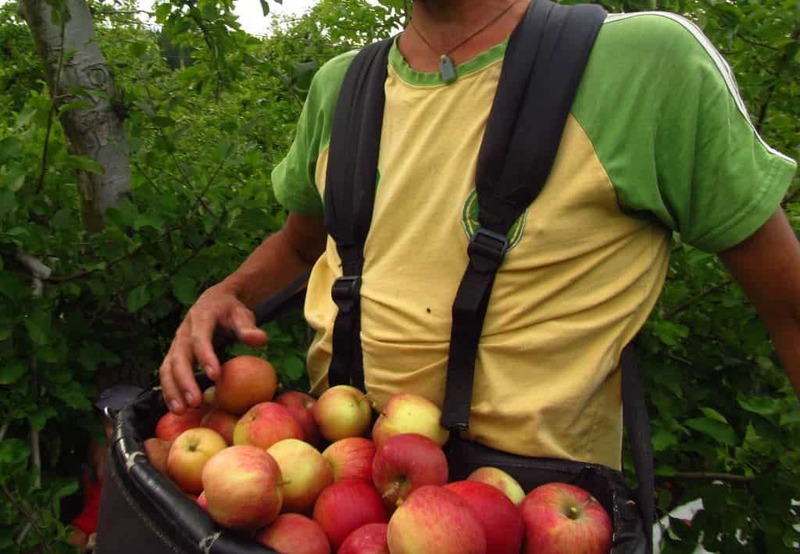 Hi,i live in Serbia,and i’ m very interesting to work as apple picker in Australia.. What i need to do? Thanks for sharing your advices! Do you have other articles to recommend about how to pick faster and better? I started today my first picking day and in 3h we (in couple) picked 2 and 1/4. Cheers mate. Hello, do you have any contacts of farms in victoria? Helllo,what about people from Slovenia,can they come to Australia and get visa for fruit pickers? Hi,i live in Malaysia ,and i’m very interested to work as an apple picker in Australia or in New Zealand… What are the procedures ? Please do let me know.